During your vacation, Put-in-Bay is ready to make your Lake Erie venture exceedingly memorable and comfortable. All the bases are covered, from properties that offer last minute getaways to family-friendly retreats to beautiful resorts that make for unforgettable island stays. 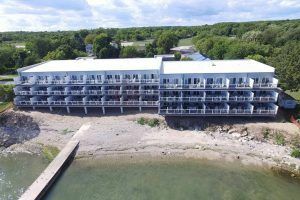 From budget friendly hotels to luxurious lakefront condos, accommodations on Put-in-Bay Island come in every shape and size. Browse Put-in-Bay resorts by area, style, price range and amenities and find your perfect room. Have a look at our listings and find the best pet-friendly places to stay, waterfont condos and downtown resorts with swimming pools, and much, much more. All hotels on the island are just a quick walk to the downtown Bay and parks! Also, be sure to check out our Vacation Rentals page if you are looking for something a little different. It just may be the difference between a good vacation and the best vacation you’ve ever had! bands at night all summer long. You can also create your own private party by renting out a cabana and living the high-roller life with bottle service and privacy. bedroom homes that accommodate 8-12 people each. And a brand new pool and pavilion complex. If you want to be lakeside, check out the pool at the brand new Put-in-Bay Waterfront Condos. Not only is this the most luxurious place to stay on the entire island, it’s also got an amazing pool for you to relax at. This is where you will find the cool people hanging out and enjoying the sunshine on a long summer weekend. Best news: You can bring your own drinks to the Island Club and Put-in-Bay Condo pools! No need to look elsewhere, Put-In-Bay Lodging is your one-stop shop for booking the best Put-In-Bay hotels and lodging. When planning a vacation – whether it is for a weekend escape or week-long excursion – you want to know you will be treated with respect, and your reservation will be considered the utmost importance. Customer service is a hallmark of every lodging option on this website. 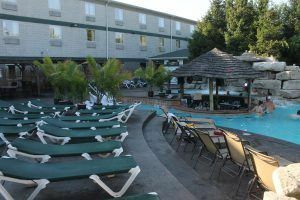 To ensure you have the best experience possible, we ensure the Put-In-Bay resort lodging or hotel you choose will be a dream. Not only will you be in the heart of South Bass Island, but you will be footsteps or a short scoot in a golf cart away from Put-in-Bay’s famous nightlife, delectable foods, craft cocktails, historic landmarks and nature-filled scenery. Not to mention the glorious beaches and sparkling pools available to you. Put-in-Bay has it all, and we want you to experience it all. That starts with your accommodations. We also provide you information on Dining, Restaurants, Put-in-Bay Bars & Pubs; a list of Frequently Asked Questions; an exciting Events Calendar; information on Transportation options for Getting Here via ferries; and a jam-packed list of Attractions & Things To Do. The fun never stops at Put-in-Bay and you can plan your trip from start to finish all in one place! Our primary goal is to help you find the Put-in-Bay accommodations that fit your needs on the beautiful Lake Erie Island village of Put-in-Bay also known as South Bass Island. Take your time and explore the various rental properties we have to offer. Put-in-Bay has something to offer for everyone and we hope you visit our island paradise. If you need more in-depth information on Put-in-Bay lodging, simply click on the Website of the property you are interested in. You can always call us as well, we would be delighted to answer your questions. Just dial the phone number below. Off-island lodging and reviews can be found on TripAdvisor.com. So choose your favorite Put-in-Bay Hotel and we will SEE YOU AT THE BAY, Put in Bay Ohio.